❆Size: Mini size, 6-1/4" x 3-1/2"
❆Not too small and not overly large, quite a bit of room for stuffer. 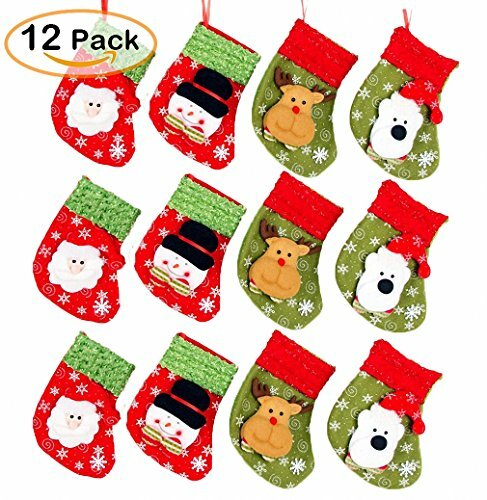 ❆Colorful stocking with cute snowman, reindeer, santa Patterns on it. ❆Hang in the tree as decoration in your office or house. ❆Hold utensils/silverware for Christmas dinner. ❆Stuff them with some goodies and give it to family, friends, neighbors, students, teachers, everyone as presents. Excellent detail. Made of durable fleece fabric. Designs are adorable. Great quality. Ribbon hooks ready for hanging on your pretty fireplace or Xmas tree. 6-1/4" tall. The perfect mini size stocking for little stocking stuffers like gifs cards, toys, stickers, chocolate, candy cane, personalized gift etc. Gift bags. Give out little treats to your family/friends/students/co-workers/children/kids. Holiday Decoration. You can personalized Xmas tree ornaments, hold utensils/silverware. If you have any questions about this product by JoyLionKay, contact us by completing and submitting the form below. If you are looking for a specif part number, please include it with your message.